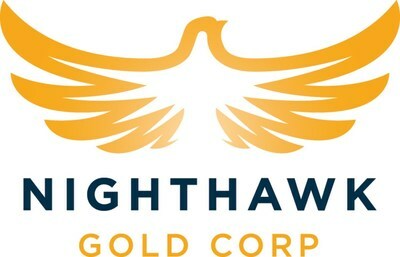 TORONTO, Sept. 18, 2018 /CNW/ - Nighthawk Gold Corp. ("Nighthawk" or the "Company") (TSX: NHK; OTCQX: MIMZF) is pleased to report drill results for eighteen holes (5,508 metres) recently completed at high-grade Zone 1.5, part of its 100% owned Colomac Gold Project ("Colomac"). 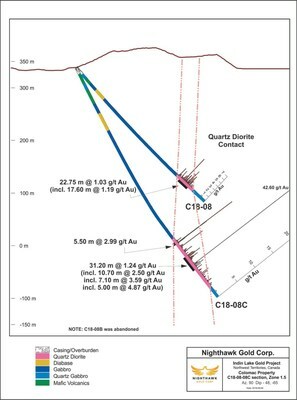 Sixteen of the eighteen holes intersected gold mineralization (Table 1) helping to define the zone's near surface dimensions and continuity down plunge to depth (Figure 1), highlighted by hole C18-05 which returned 84.30 metres of 2.91 grams per tonne gold ("gpt" "Au"), including 24.55 metres of 5.05 gpt Au, and 4.25 metres of 8.11 gpt Au. Dr. Michael Byron, President and CEO commented, "The results released today have further constrained the dimensions of Zone 1.5 to depth and infilled gaps in the near surface drill coverage. 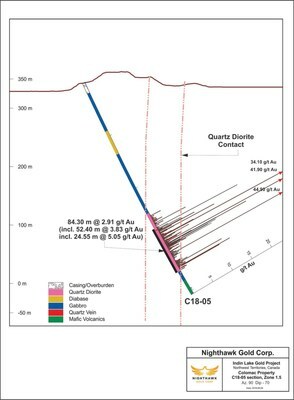 All results released to date from the Colomac Project have had an extremely high hit rate for intersecting gold mineralization and attests to the vitality of the gold system and the heightened prospects for new discoveries. Additional results from Colomac will include drilling at Zones 2.5 and 3.0. "Our 2018 Indin Lake Project exploration program is now complete and has been our most ambitious and expansive undertaking to-date that included 32,504 metres of drilling, of which 17,883 metres have now been reported. The remaining drill results from some of our more prospective regional prospects including Damoti Lake, Treasure Island and Swamp will be released once all the data has been received." 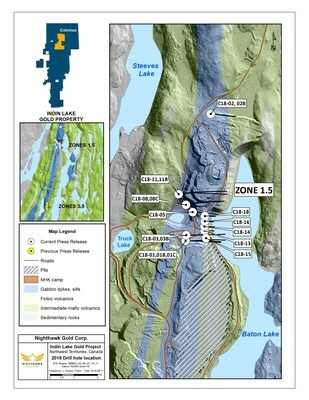 Since the discovery of Zone 1.5 in 2014 (see press release dated December 3, 2014), Nighthawk has focused on refining the zone's dimensions and developing an understanding of the controls on the unique style of higher-grade mineralization within the Colomac system. That knowledge is vital for the successful exploration and discovery of other higher-grade domains believed to exist within the Colomac area sills. The current round of drilling was directed at testing the up-plunge projection of the zone to the south, infilling the near surface portion of the zone that lacked information, and to better constrain the north plunging system to depth. Three holes, C18-01, C18-01B, and C18-01C explored the southern projection of the higher-grade core to Zone 1.5 (Figure 1) where a gap existed in drill coverage next to the boundary fault that separates Zone 1.5 from Zone 2.0. The fault strikes to the northeast (070o) with a subvertical dip (80o) to the southeast. Holes were drilled at variable dips to test the zone from 130 meters depth (C18-01) to 330 metres depth (C18-01C). 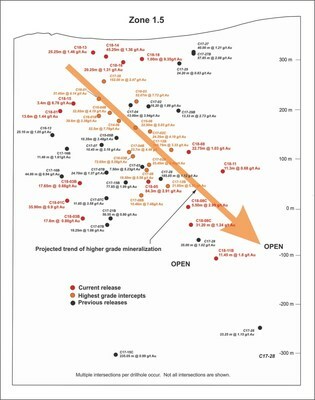 All holes intersected mineralization, some over significant core lengths, but average grades were less than what is typical of the higher-grade core to the zone. Hole C18-01 intersected 13.60 metres of 1.44 gpt Au, including 6.30 metres of 2.51 gpt Au; and hole C18-01C intersected 35.90 metres of 0.90 gpt Au, including 9.90 metres of 1.65 gpt Au. Drill results show that the intensity of the zone's high-grade mineralization appears to diminish towards the boundary fault, rendering these holes as being important for establishing the zones southern perimeter. This news release contains "forward-looking information" within the meaning of applicable Canadian securities legislation. Forward-looking information includes, but is not limited to, information with respect to the Company's exploration plans and its drilling program and the timing and results thereof; the ability to add tonnes and ounces to the Colomac Gold Project, and the timing and results thereof. Generally, forward-looking information can be identified by the use of forward-looking terminology such as "plans", "expects", or "does not expect", "is expected", "budget", "scheduled", "estimates", "forecasts", "intends", "anticipates", or "does not anticipate", or "believes" or variations of such words and phrases or state that certain actions, events or results "may", "could", "would", "might", or "will be taken", "occur", or "be achieved".